Top management at NBC didn’t know that Rachel Maddow had two pages of President Trump’s tax returns and was going to make it the subject of her next show, until Maddow’s pre-show tweet went viral, And in typical progressive fashion Maddow contends the reason people thought the show was disappointing was that the audience expected too much. That’s the venom which Maddow and MSNBC operate. They have such hatred for President Trump, they didn’t want to give management the opportunity to mess it up and prevent them from damaging the president (of course, it helped the president). Perhaps they were worried the corporate bigs would say no to/or even delay the “scoop.’ But if the had management on their side before the show then management would help cover their backsides. But now, after the fiasco, after MSNBC and NBC news have becoming a laughing stock because of the fiasco— now they are all alone, and every time President Trump or Sean Spicer bashes NBC News, their President, Noah Oppenheim grows more angry. And of the 20 minutes of droning on and on before her not so big reveal? “My priority is to get the story right and put it into proper context, and explain the weight of it and why it is important,” Maddow said. While she didn’t reveal the income figures immediately, she did tell viewers at the top of the show the exact documents that were obtained and how they came to light, she said. The fact that the material was leaked — and the Trump administration contended that it was illegal for Maddow to publicize it — is as important as what it revealed, Maddow said. If it happened once, it’s likely to happen again, she said. “This is a super interesting first window into his finances, and the question of his finances is a legitimate scandal,” she said. White House Press Secretary Sean Spicer said Wednesday that he’d have to follow up with the president’s lawyer when asked if any legal action is being contemplated against NBC. 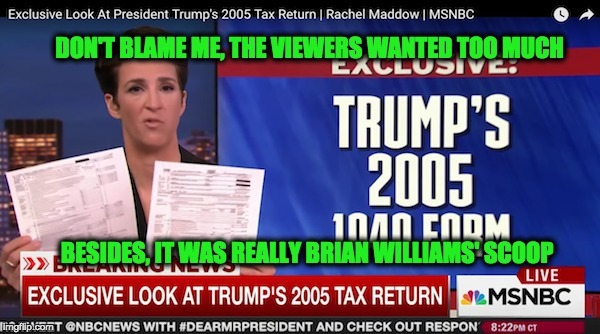 Thats another thing about MSNBC and the liberals, they care about President Trump’s taxes, no one else does. Maddow, however, should have given the credit to the scoop to Brian Williams, he loves taking credit for thing which he had no role.